The amendment to the San Francisco Fair Chance Ordinance became effective on October 1, 2018. The San Francisco Board of Supervisors passed the amendment on April 3, 2018. The full text of the legislation is available here. The Fair Chance Ordinance applies to employers with 5 or more employees worldwide. Employers are prohibited from inquiring a person’s conviction history until after a conditional offer of employment. Employers may never consider convictions for decriminalized behavior, including convictions for the non-commercial use and cultivation of cannabis. Penalties for non-compliance have increased and must be paid directly to affected employees. Any employee or applicant whose rights have been violated is authorized to sue. Please review the Summary of Changes for Employers (PDF). 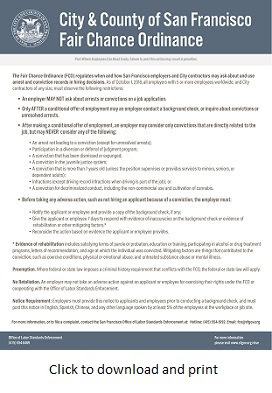 Employers must also display the new Fair Chance Ordinance posters informing employees of their rights. Download a PDF of the multilingual posters. For more information, visit . You can also call (415) 554-5192 or email fco@sfgov.org.